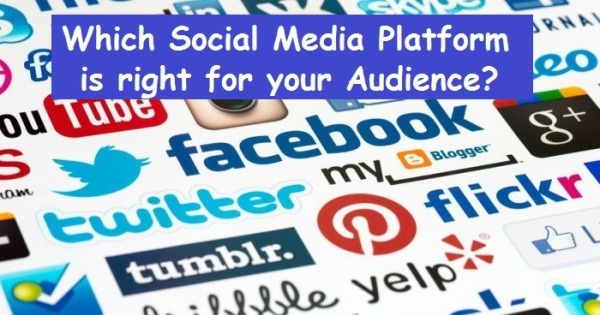 Which Social Media Platform Is Right For Your Audience? As the numbers of people with smartphones, tablets and easy access to the Internet increases, so does their appetite for social media. As a result organisations can no longer afford to turn a blind eye to social media marketing. Although these figures are for other countries, Australians too are following the trend. Whether you choose to sell domestically or break into the international market, social media can have a big effect on your sales. Convinced? The challenge is deciding which platforms to engage with. Previously businesses could be confident they had covered all bases by including Facebook and Twitter as part of their marketing strategy. But with the growth of all things online, the development in social media sites has also been big. It is not just about being aware of what platforms are out there, but understanding which one is going to work best for your audience and what they can each offer in return. The key first step is defining your target consumer. Large organisations have teams and budgets dedicated to this very specific task. Smaller business can achieve the same by answering a few simple questions. The exercise will hopefully lead to some inspiring conclusions about your consumer demographics including age, gender, location, income level, occupation, marital/family status, ethnicity and education level. Now you have some idea about who might be buying your product/service but to really get to the bottom of a social media strategy, you also need to know why. Experts call this part of the process ‘defining psychographics’. Work with employees on the front line and get them to answer key questions around customer likes/dislikes, the TV/films they watch, newspapers/magazines they read, what they value and how your product/service fits into their lifestyle? Social media is as much about your aspirational customers as it is about your existing customers. The defining demographics and psycho graphics process should also be done with potential customers in mind. Having documented evidence of the thought process will help to outline where the focus of your strategy needs to be. Give each target group a name to help you or your creative team develop relevant and interesting social media content. Alternatively you could conduct an analysis of competitor social media content and check who they think their target audience is. 99% of top brands are on Facebook. The network has in the region of 30 millions users worldwide and Ofcom reports that it is the default platform for UK adults online (96%). Facebook is not known for being the best for sales generation, but it is the ideal choice for increasing brand awareness. However a study of 5,000 teenagers found that the number who consider Facebook the most important social media site has fallen 10% in the past year, probably because of the numbers of parents who deciding to join up! When ever you create a website and make a new page or post always promote the URL on Facebook and get a free backlink. Whatever your business type you should be on Facebook. Questions posts generate double the engagement of non-question posts. Build up a profile that makes your account the go to choice for industry specifics – keep abreast of latest research, trends and news events that affect your sector. 90% of twitter users follow brands to get discounts and promotions so keep this in mind when posting content. Tweets with images have seen an 89% increase in favorites and a 150% increase in re-tweets. 300 million Instagram users worldwide (280 for Twitter). Users are predominantly female and are more likely to live in urban areas. 90% of users are under 35. As such clothing, accessories and entertainment-related brands find this channel more attractive. Put thought into images to get better engagement. User generated content gets more ‘loves’ and comments than business led posts so maybe an Instagram photo contest is on the cards? Has the best ROI for its key demographic, which like Instagram is also female, dominated (84%). Business who should take advantage of this network is Fashion, photographers, jewelers, home-hardware stores (DIY). Pinterest is ideal for eCommerce organisations because a ‘pin’ acts as a great endorsement as well as staying relevant for a lot longer. Studies have found that each pin on Pinterest can generate, on average, two website visits and six pageviews. Work towards ‘rich pins’, these are brand pins with more information such as product pins which may include size, weight, price, ingredients. Other platforms: Google+ is recommended for technology and engineering related firms as well as marketing individuals. Professionals and professional businesses that sell B2B should look to having a presence on this platform. It’s absolutely essential to ensure your profile is fully completed and you post industry related blogs to establish yourself as a voice in the wider community. Looking at the social media opportunities for your business will certainly help to engage your audience and keep them coming back for more. Whether you feel you need a presence across all platforms, or you stick to just one, it’s bound to have some great effects on your business.